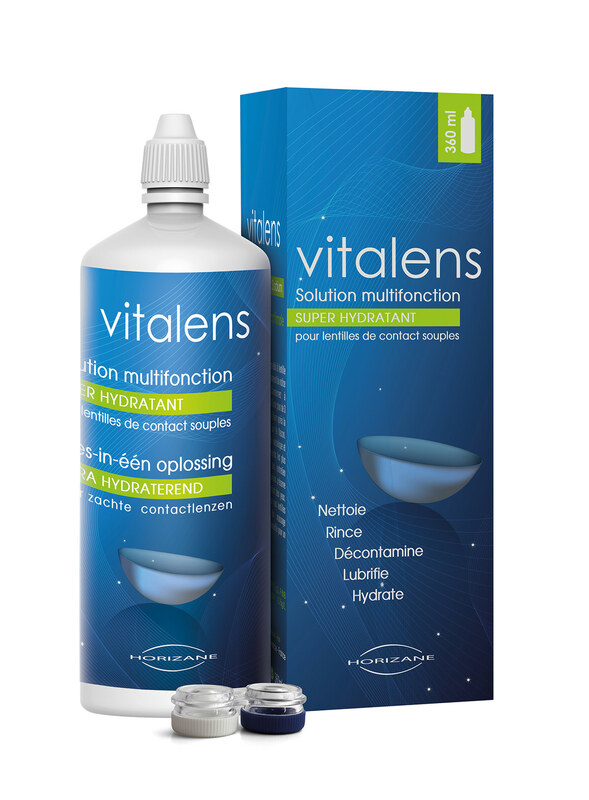 Vitalens: the multi-function and multi-format solution for your soft contact lenses! 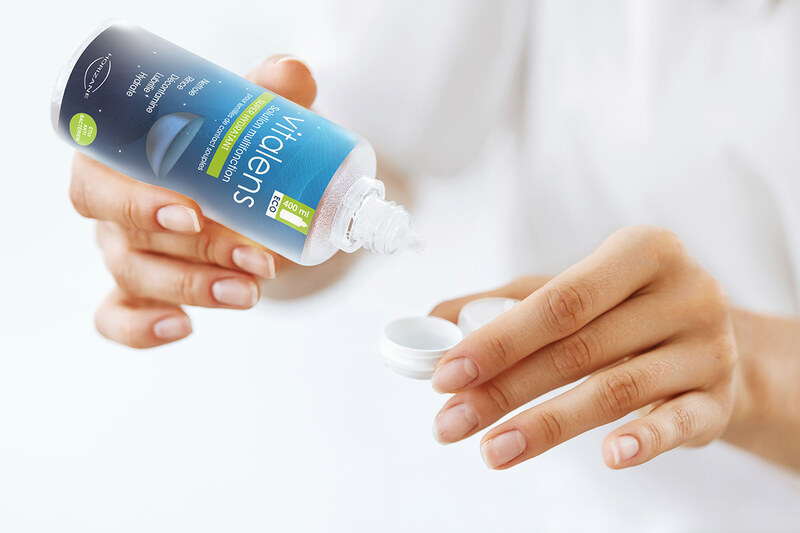 The “contact lens care solution”: discover how Vitalens gently takes care of your soft contact lenses. Affordable and qualitative contact lens care solution, Vitalens is the only multi-purpose contact lens care solution that combines two major innovations for your comfort, safety and security at a competitive and affordable price. Advantage N°1: perfectly clean and disinfect your soft contact lenses in a gentle yet efficient way. It leaves a unique sensation of freshness when you put them on. Advantage N°2: available in different sizes that match your needs, either you use it at home or while you are away, whenever you want: at work, at the gym, when partying or on a trip. Whether you choose the travel pack, the handy mini-format for when you are out or the bigger format for your home, make up your choice! You will always find what you need! 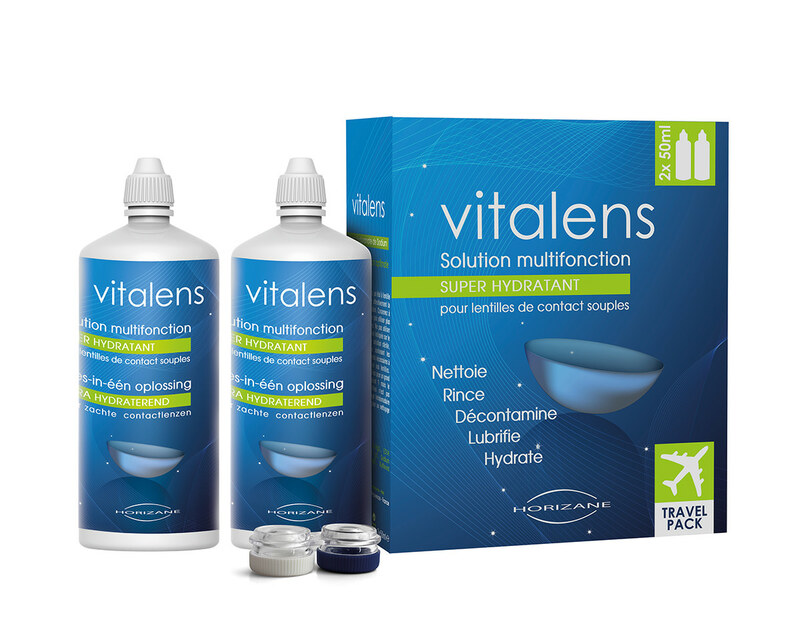 Thanks to these two advantages, Vitalens is a multi-purpose contact lens care solution highly appreciated both in France and in Europe by all soft contact lens wearers who are energetic, demanding and willing to get visual comfort easily. Please consult “Solution for soft contact lens care”: advice from Vitalens” for all soft contact lenses wearers”. Vitalens, the multi-purpose contact lens care solution: quickly and easily clean your soft contact lenses quickly and easily wherever you are. Taking so much time to clean your contact lenses is over! Vitalens, the all-in-one solution is composed by 8 active principles that quickly and securely clean your contact lenses. They will be as comfortable as the first day of use! 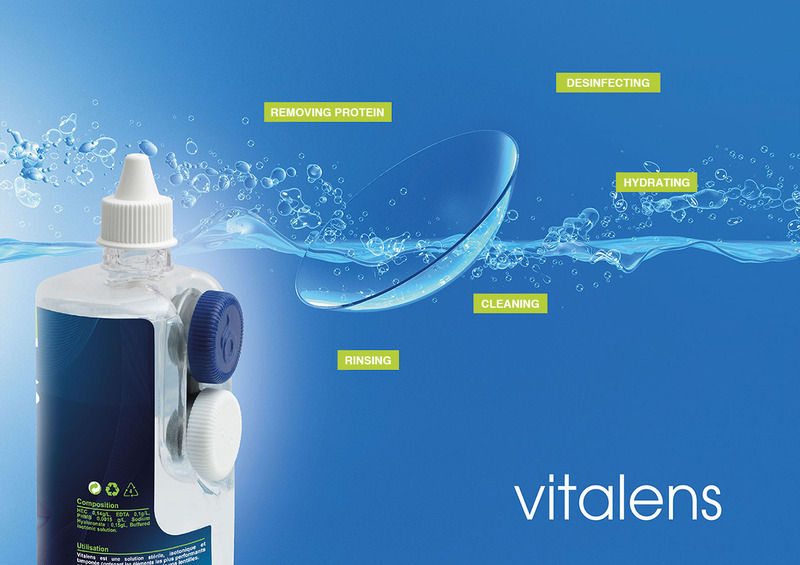 Thanks to Vitalens, the cleaning solution for all soft contact lenses from Horizane laboratory, you have an innovating and efficient multi-purpose solution that easily and gently take care of your contact lenses by implementing 5 actions: cleaning, hydrating, removing protein deposits, disinfecting and rinsing. Your soft contact lenses will be clean and clear and your eyes will shine bright! Hyaluronic acid: your contact lenses are clean and soft every day. In cosmetics, the action of the Hyaluronic acid is no longer to be proven: it has a high hydrating power and improves skin elasticity. Vitalens Laboratory has decided to introduce this powerful natural component in the formula for its unmatched hydrating power. Your contact lenses will be hydrated by the hyaluronic acid and will be as soft as a water drop on your eye. The contact lenses will give you a sensation of freshness and great comfort which is highly appreciated by contact lenses wearers, whether in the morning when placing them on or during the day while wearing them. Thanks to Vitalens, your soft contact lens care solution with hyaluronic acid, you won’t even remember you are wearing soft contact lenses! Vitalens, your multi-purpose contact lens care solution: one size matches one need! In order to bring comfort and functionalism to contact lenses wearers, Vitalens’ teams are constantly working on innovations. They have created different sizes for your Vitalens multi-purpose contact lens care solution and different solutions to protect your contact lenses. Whatever your activity and whatever the moment of the day, Vitalens multi-purpose contact lens care solution can be used either in the bathroom or on the way thanks to its adapted packaging. You can choose from 6 different sizes: from the 50ml that perfectly fits your handbag, work bag or trekking backpack to the very handy 400ml bottle that perfectly fits your bathroom for a sedentary use. Vitalens innovation: a unique 400ml bottle including a contact lenses case. You do not need to store nor look after the case all over your house as it is already clipped on the bottle! You will save some precious time thanks to this wonderful innovation! Vitalens, multi-purpose contact lens care solution: why should you choose Vitalens? • An all-in-one contact lens care solution: as a multi-purpose solution, Vitalens cleans and disinfects your contact lenses in only one operation thanks to 8 powerful molecules. • Really gentle: the hyaluronic acid makes your contact lenses well hydrated for a comfort contact lenses wearers do appreciate. • Really convenient: 6 different sizes matching every need in one day, either sedentary or on the go: at work, at the gym, while travelling, during a party, etc. • A really good quality/price ratio: performant, safe, healthy, soft and easy to use at a reasonable price. • Only available in pharmacies: a qualitative environment where you can get serious advice and information for your health on a contact lens care solution formulated and controlled in a bacteria free environment. Vitalens, multi-purpose solution: a contact lens care solution at a very affordable price. Horizane Laboratory is offering Vitalens multi-purpose solution at a very affordable and competitive price for a daily use as we feel concerned by bringing the best of the Research to contact lenses wearers. Whatever the size you pick among the 6 available, purchase conditions remain attractive for a daily use contact lens care solution used by contact lenses wearers on a long term.